Halve each zucchini lengthwise. Using a teaspoon, scoop out the seeds. Shred the zucchini, using the coarsest side of a box grater; there should be 4 cups. In a deep saucepan, bring the broth to a gentle boil over medium-high heat. Add the zucchini, onion and leek. Reduce the heat and simmer, covered, until the vegetables are tender but not falling apart, 15 minutes. Uncover, and cool the soup for 10 minutes. Season to taste with salt. Cool the soup to room temperature. If serving soon, refrigerate the soup, covered, until well chilled, 6 to 24 hours. Divide it among wide, shallow bowls, and garnish with chives or dill. To freeze, divide the soup among resealable 1-quart plastic freezer bags and refrigerate to chill. Freeze the bags of chilled soup flat on a baking sheet lined with wax paper. To defrost, thaw the soup on a plate in the refrigerator. 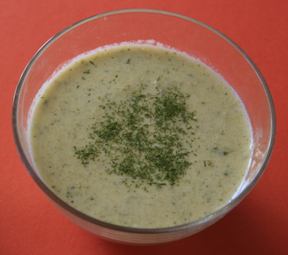 If the soup is grainy, whirl it briefly in a blender. Pour into wide, shallow bowls, garnish with chives or dill, and serve.